édité le 27/08/2018 - Plus de news de "Socar" - Voir la fiche entreprise de "Socar"
Uniper SE and SOCAR will collaborate on projects aimed at improving the energy efficiency of oil and gas production in Azerbaijan. The two companies signed an agreement to that effect today in Baku during of German Chancellor Angela Merkel’s trip to Azerbaijan. The German energy provider and the Azerbaijan state oil and gas company have been working in close cooperation for the past five years. The principle aim of the new agreement is to enhance efficiency in energy use in production processes and thereby lower greenhouse gas emissions in Azerbaijan. Initial projects have already been identified and are now set to be reviewed in greater detail. The feasibility study shows, thanks to the application of modern technologies, a significant achievement of natural gas savings in the gas grid is possible. Back in 2013, Uniper and SOCAR concluded a long-term gas supply contract. Until 2045, up to 1.5 billion m³ of natural gas is slated to flow to Europe each year via the so-called Southern Gas Corridor. These gas deliveries serve to diversify the European and with it the German gas supplies and enhance security of supply and competition. In 2016 SOCAR and Uniper formed a joint venture for the development of energy efficiency. The JV will gain additional value by modernizing and expanding the electricity and steam generation facilities at the SOCAR chemical complex in Sumgayit Azerikimya. The launch of new facilities is scheduled for early 2020. The German government is assisting the project through a HERMES export credit guarantee. With an investment volume of around 30 million euros, the project draws mainly on German technology. 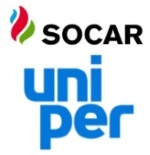 Uniper and SOCAR are also bound together by their longstanding partnership. This partnership covers projects in the fields of technology, energy management, management training and corporate social responsibility. Uniper is an international energy company with around 12,000 employees worldwide. The company operates about 36 Gigawatt of reliable power generating capacity in Europe and Russia, which consists mainly of gas, coal and hydro power plants. With its balanced portfolio and its technical and commercial expertise, Uniper is able to offer attractive and customized products and services at competitive prices. Uniper's trading activities create links between global energy markets. These activities comprise the entire value chain for commodities trading in markets for electricity, emission allowances, natural gas, liquefied natural gas (LNG), coal and freight. Moreover, the company's experience in asset operation and global trading serve as the basis for comprehensive service packages that - in addition to asset management - can also include supplying raw materials and fuels as well as operational management of power plants.